At Kidd-Luukko Corporation, we’re committed to high-quality roofing projects but we’re also committed to providing our New England neighbors with practical information they can use to prolong the life of their roofs. With that in mind, here are areas of your roof that are prone to water damage and require a diligent homeowner’s eye. Expert roofers know that roof valleys are places where two planes of your roof come together–almost always in a slope. This creates a place where rain temporarily collects as it drains down the roof. If the seams are not sealed properly, rain can get inside. They can also be damaged if they have sustained impacts such as hail damage. Your roofline is the area where the roof starts on the ends of your roof, closest to your gutters. It’s vulnerable since it’s not completely covered by shingles. It is susceptible to damage from water both on the roof and collected in the gutters, especially if there is a clog. Perhaps the most overlooked parts of your roof are the flashings, thin pieces of metal installed under shingles and on the joints of your roof. The purpose of flashings is to form water resistance in a way that is not obvious. Chimneys often require shingles to be manipulated or cut in a way that allows them to fit around the chimney, which makes them more vulnerable. Additionally, the heat from the chimney can damage the shingles and any nearby caulk. It’s a good idea to safely inspect these areas regularly, especially after our harsh New England winters. 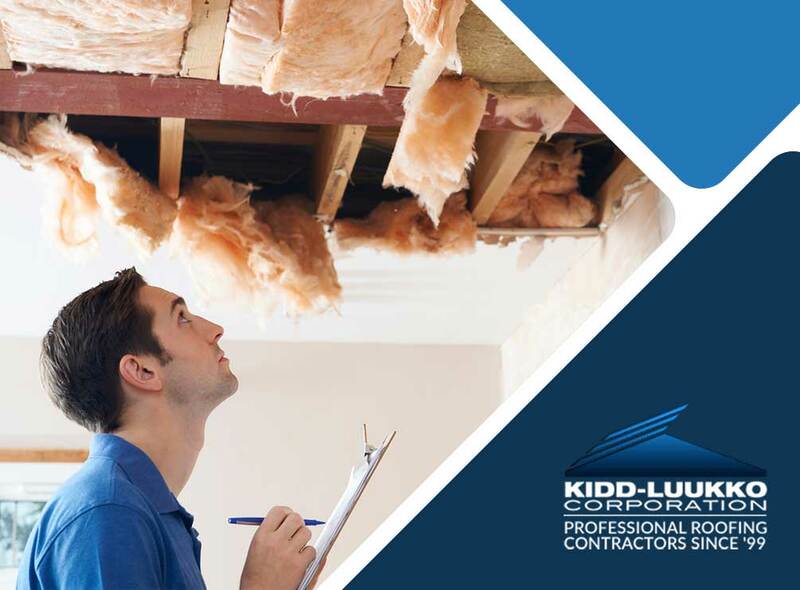 When in doubt, the roof repair experts at Kidd-Luukko Corporation are happy to lend a hand. Call us at (508) 372-0400 or fill out our contact form for a free estimate. We serve clients in Hartford, CT, Springfield, MA, Providence, RI, and other nearby areas.